Chefs Mark Gaier and Clark Frasier do - and because fresh ingredients are a key to good food, they grow much of the produce used in their restaurants themselves. Almost 20 years ago, they opened the now-acclaimed "Arrows" restaurant in Ogunquit, Maine. Their new venture is "SummerWinter," in Burlington, Mass., near Boston. Gaier and Frasier are loved in Maine, and recognized nationally. 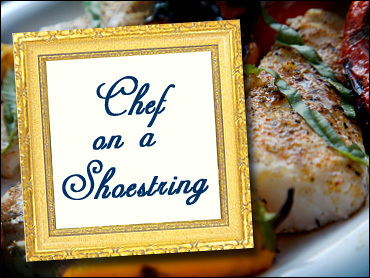 As The Saturday Early Show's "Chefs on a Shoestring," they made a three-course, seasonal dinner for four on the show's $40 budget. The menu was Warm Red Cabbage Slaw; Sautéed Cod with Tangerine Sauce; and Pecan Pound Cake with Spiced Whipped Cream. Gaier and Frasier met while working with an acclaimed San Francisco chef. They eventually moved to Maine, where Gaier had worked before living in California. In 1988, the two opened Arrows, a simple country restaurant in a restored farmhouse. Over the next two decades, they developed more than two acres of gardens and a greenhouse - out of necessity, to supply the eatery with the fresh produce and herbs they were accustomed to in California. In 2003, the chefs penned "The Arrows Cookbook; Cooking and Gardening from Maine's Most Beautiful Farmhouse Restaurant," a collection of the restaurant's most celebrated and accessible recipes, with useful cooking and gardening tips. Arrows continues to garner national and international accolades for its outstanding cuisine, flawless service, beautiful setting, and award-winning wine list. Honros include "One of America's Top 50 Restaurants" in 2006, by Gourmet magazine, and a nomination for James Beard's "Best Chefs, Northeast" this year. The chefs' have been featured in leading food and general magazines, and have made frequent appearances on local and national television programs. In 2005, they opened MC Perkins Cove in Ogunquit, a sleek and simple restaurant with stunning ocean views and straight-forward, classic New England fare. This year, they partnered with Marriott, dedicating their talent and experience to open SummerWinter, where they put the visual example of sustainability on center stage with an on-premises greenhouse that feeds the restaurant's seasonal and modern American menu. Cabbage: Although broccoli, Brussels sprouts and kale are all members of the cabbage family, the main cabbage used in the United States is the compact heads of waxy, tightly-wrapped leaves that range from white, to green, to red. Cabbage can be cooked or eaten raw. Although coleslaw is generally eaten cold and made with raw cabbage, Gaier and Frasier are turning this tradition on its head with their warm 'slaw. Also, instead of stirring a creamy mixture into the slaw, they serve a dollop of creamy goat cheese on top. Star Anise: The chefs use this spice in their tangerine sauce. The star-shaped, brown pod contains a pea-sized seed in each of its eight segments. Native to China, the flavor is a more bitter version of anise. In Asian countries. it's commonly used to flavor teas; in the West, it's widely used in liqueurs and baked goods. Pound Cake: Originally, this fine-textured loaf cake was made with one pound each of flour, butter, sugar and eggs, plus a flavoring such as vanilla or lemon. Many variations have evolved throughout the years. 1. In a medium bowl combine the goat cheese, lemon juice, parsley, thyme, 1 teaspoon salt, and 1/2 teaspoon pepper. Stir in the cream. Cover and refrigerate until needed or for up to 1 day. 2. Preheat the oven to over 350 degrees F.
3. Line a cookie sheet with parchment paper. Spread the bacon slices on the cookie sheet and bake until crisp, about 20 minutes. Remove from the oven and set in a warm place. 4. Warm the olive oil in a large sauté pan over medium-high heat. Toss the cabbage with the vinegar in a large bowl and sprinkle with 1 teaspoon salt and 1/4 teaspoon pepper. Add the cabbage to the pan and cook, stirring constantly, until the cabbage is hot and slightly wilted, about 5 minutes. 5. Divide the cabbage among 4 warm plates, arrange a dollop of goat cheese and 2 slices of bacon on top, and immediately. 1. Using a vegetable peeler, remove the zest from the tangerines, taking care to avoid the white pith. Set the zest aside. Juice the tangerines. 2. In a medium stainless-steel saucepan, warm the clarified butter over high heat until smoking. Add the tangerine peels and stir continuously until the peels are nicely browned all over, almost burnt around the edges, 4 to 5 minutes. Add the tangerine juice, star anise, vinegar, and ginger. Boil until the liquid is reduced by three-quarters and the sauce is thick and syrupy. Strain through a fine sieve into another stainless-steel saucepan, discarding the solids. 3. No more than 30 minutes before serving, warm the syrup over medium-low heat; do not boil. Whisk in the butter, 1 tablespoon at a time, and season to taste with salt and pepper. Cover and keep warm while you cook the fish. 2. Warm the butter in a large sauté pan over medium-high heat. Sprinkle the cod fillets with salt and pepper. Brown the cod for 1 minute on each side. (Depending on the size of your pan, you may have to brown the cod in 2 batches.) Transfer the pan to the oven. (If you browned the cod in 2 batches, arrange them on a baking sheet large enough to hold them all.) Bake for 4 minutes until the cod is just translucent; do not overcook the cod, as it will fall apart. Remove the pan from the oven and transfer the cod fillets to 4 warm plates. Ladle some of the sauce over each fish, sprinkle with the scallions, and serve immediately. 1. Preheat the oven to 325 degrees F. Butter and flour a 9 x 5 x 3-inch pan. 2. With an electric mixer (or by hand using a wire whisk), beat the butter and sugar together until light in color, 3 to 5 minutes. 3. Add the eggs one at a time, beating to blend each one. Stir in the sour cream and vanilla and add the flour, stirring continuously until it is incorporated. Fold in the pecans. 4. Spread the batter in the prepared pan. Bake for 50 to 60 minutes until a toothpick inserted in the center comes out clean. Remove from the oven and cool for 5 minutes. Unmold and cool completely on a rack. Serve with caramelized apples. 1. Place whipping cream in cold mixing bowl and add sugar and spices. 2. Whisk by hand or medium speed with a hand mixer until stiff peaks form.